Edwards Baking Company was founded in 1950 by Tom Edwards as a small bakeshop in Atlanta, Georgia. After operating as a small business and experiencing great success selling a variety of baked goods they began to focus solely on dessert pies. Mr. Edwards began selling frozen pre-baked pies to retail stores and later began selling individually packaged pie slices.In 2011 Edwards Baking Company was purchased by The Schwan Food Company the same company that markets leading brands such as Mrs. Smith's Pies, Tony's Pizza, and Red Baron. 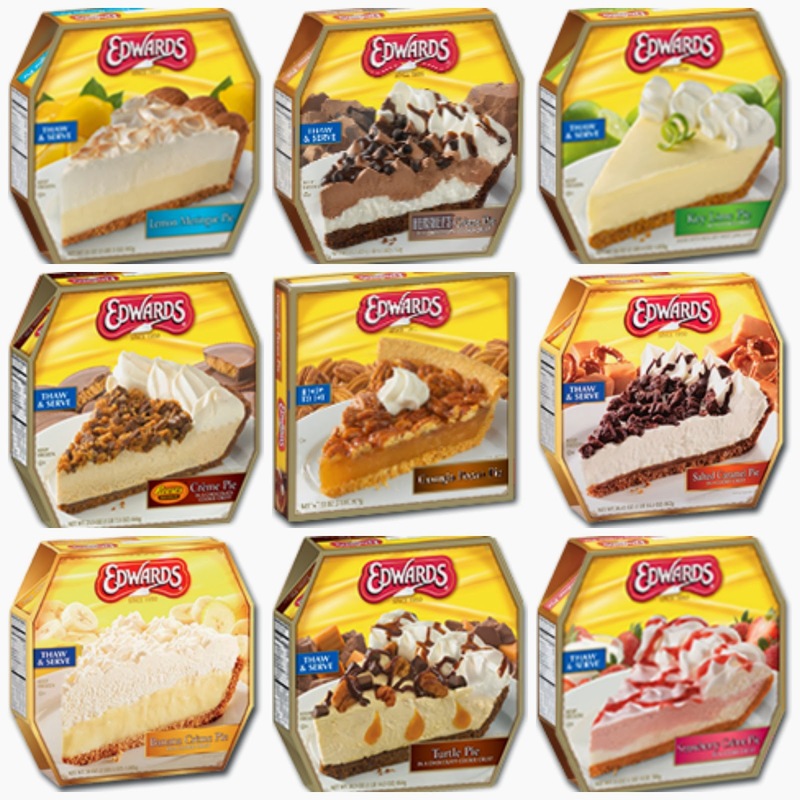 The Edwards Baking Company is committed to bringing customers convenient, high quality, and great tasting desserts.The Edwards Baking Company has many different flavors of pie, so they will definitely have a perfect pie for your family. Some of their pies are more rich and chocolate based such as Turtle Pie and Hershey's Chocolate Pie. Other pies from Edwards are more fruity such as Key Lime of Banana Cream Pie. These pies from Edwards Baking Company can be found in many leading retailers such as Walmart, Shop Rite, and more! Below I am going to tell you a bit about the three pies that I got to review! Below you also have a chance to win three pies! Also check out The 12 Days of Edwards song, a spin on the 12 Days of Christmas at the bottom of the review! The first pie that we reviewed is the Salted Caramel Creme Pie. This pie is a graham cracker crust with a vanilla bean creme filling. It is then topped with chocolate covered pretzel pieces, caramel, whipped cream topping, and a chocolate drizzle. I absolutely love salted caramel flavored things and this pie was no exception. It is light and sweet which a hint of salty from the pretzels. Graham cracker crust is also my favorite type of crust and this crust was delicious. My mom and sister enjoyed this pie a lot as well. The second pie that we reviewed is the Georgia Pecan Pie. This pie is flaky pastry crust filled with a classic pecan pie filling and loaded on top with pecans. My husband loves pecan pie, it is his absolute favorite and he loved this pie. This pie was a perfect take on a Southern tradition. The third pie that we reviewed is the Reese's Creme Pie. This pie is a peanut butter filling sitting in a cocoa crust and topped with Reese's Peanut Butter Cup pieces and a Reese's flavored drizzle. My whole family is obsessed with Reese's so as soon as we saw this pie we knew that we had to get it. My daughter who is almost five was so excited to try this since she loves anything chocolate peanut butter flavored. This pie is amazing, and has such a rich flavor. My absolute favorite thing about these pies from Edwards Baking Company is that there is no baking, all that is required is thawing and then it is ready to be sliced and eaten! During the holiday season I am constantly using my oven for desserts and large meals, these make the perfect Christmas dessert because I don't have to worry about how I am going to get dessert baked and cook my Christmas dinner at the same time!